I was an Army Officer for 15 years (Royal Tank Regiment), a Commercial Archaeologist for 13 years (just as it was starting), Professor of Archaeology at the University of York for 22 years (steep learning curve - I don't have a degree in archaeology) and Editor of Antiquity for 10 years. Since 2008 I have been a full-time professional writer, public speaker and broadcaster. My research has been mainly in England, Scotland, France, Italy and Algeria - my best known excavations were at the seventh-century royal burial ground at Sutton Hoo in Suffolk and the eighth-century Pictish Monastery at Portmahomack, Easter Ross. In 2014 I began a new project 'Sicily in Transition' (SICTRANSIT for short) in partnership with Alessandra Molinari of the University of Rome Tor Vergata. Like the other two this project is concerned with what happens to people when a new regime is imposed on them. 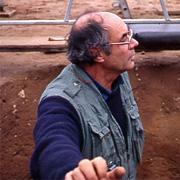 I am Professor emeritus at the University of York and Chairman of the commercial archaeology company FAS-Heritage Ltd. I live in Ellerton, East Yorkshire with Madeleine Hummler an archaeologist, translator (French, German, Italian) and editor. Contact me at email martin.carver [at] york.ac.uk. Father: John Hobart Carver Colonel in the Bengal Sappers and Miners, Ghurkha Engineers and Royal Engineers. Mother: Jocelyn Louisa Grace Tweedie. The final report of the Portmahomack campaign by Martin Carver, Justin Garner-Lahire and Cecily Spall, co-directors.